They've won Brits, they've gathered up Grammys and copped Ivor Novello awards (more than I ever will for that headline) [damn right there! - Ed]. In Keane's short life, they have achieved more than most their age and, perhaps a little unfairly, borne the brunt of a media back-lash. But, the hits have kept on coming - "Somewhere Only We Know", "Everything Changes", "This is the Last Time" and "Is it Any Wonder?" all made the Top 20. Their 3 albums have all reached number one. It seems the magazines and critics would like them to be a bit less 'Robbie' and a bit more 'Roy'. Whatever, the lads have joined forces with the Forestry Commission to play several forest dates during the summer of 2010. Following the example set by Simply Red, who are playing the same venues on different dates, Keane will begin their tour on June 10th in Thetford Forest and continue to Bedgebury Pinetum on the 11th, Westonbirt on the 18th, Sherwood Pines on the 19th, Dalby Forest on the 25th and concluding at Cannock Chase Forest on the 26th. Tickets go on sale on Friday 4th December at 9am, priced at £32 plus fees. The government-run Forestry Commission will benefit from the ticket-sales and use the money to maintain our woodlands and countryside to a safe and high standard, as well as preserve wildlife. 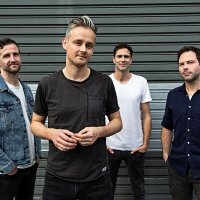 Keane have also announced the release of their first new material since their 2008 best-selling album, 'Perfect Symmetry'. The EP will be called 'Night Train' and features collaborations with K'Naan and MC Tigarah. You can pre-order the release on the band's website from Wednesday 2nd Dec, with the official release date being pencilled in for May 2010.